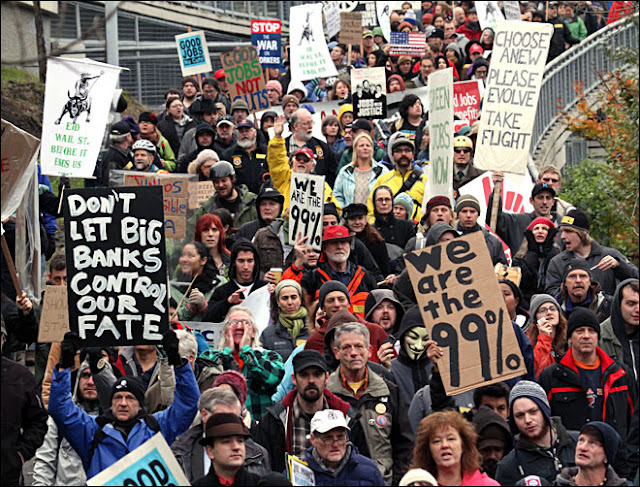 I never agreed with the critics who complained that the Occupy movement lacked a message. I watched mainstream media daily repeat the words "We are the 99%" (a sign with that message is still in our front window). It was a strong statement that the ruling 1% is stealing us all blind. That message resonated loud and clear to me and likely with most people. Thus it is no surprise that Bernie Sanders has grabbed that theme and folks who feel they have no future are solidly in his camp. But I have no faith in the corporate dominated Democrat Party. I wrote to Green Party presidential candidate Jill Stein this morning forwarding the article by Holly Wood (see below post). I told Jill: "Have you seen this brilliant piece? Quite impressive. Keep pushing – I still believe the corporate Dems will sandbag Sanders and these young folks will be looking around – so stay relevant. I’m sending you $27 today." The power boys are freaking out - this current manifestation of the Occupy message can't be dragged out of some park. People are now occupying the voting booth and are calling the bluff of the 'democracy builders' that run Washington. It's going to be fascinating to see how the corporate oligarchy will react next - the young folks ain't paying attention to the editorial writers at the New York Times and Washington Post. MB and I watched Trump's speech last night after he won the New Hampshire Republican primary. Big talking, say nothing, ego-centric, illogical to thinking humans, greedy, and selfish. I remarked that his campaign is the perfect symbol for the collapsing US empire. Hillary Clinton (like Jeb Bush) faces the misfortune of running a legacy campaign at a time when the voters are angry about the legacies of both “ruling families,” the Clintons and the Bushes. Though Sanders is a flawed candidate faulted for his muddled foreign-policy prescriptions, he (like Trump) has seized the mantle of fighting the Establishment at a time when millions of Americans are fed up with the Establishment and its self-serving policies...If Clinton continues to stumble, there will be enormous pressure from Democratic leaders to push her aside and draw Vice President Joe Biden or perhaps Sen. Elizabeth Warren into the race. We had our first Lenten vigil at Bath Iron Works today. Thirteen folks joined us across from the administration building at the shipyard. We got quite a few car honks (even some from workers) - I think people like our message that rail systems and wind turbines should be produced instead of more death inducing Navy destroyers. We return again each Saturday all through Lent (Feb 13, 20, 27 and March 5, 12, 19, 26) from 11:30 am to 12:30. A wonderful surprise appeared in the Global Network's post office box yesterday. An unsolicited grant in the amount of $25,000 came in from craigslist Charitable Fund. This is the 3rd year in a row that this donation came to us. The support from craigslist has really made it possible for us to expand our international outreach. In the attached letter the Charitable Fund wrote, "Your mission and good work are appreciated." We are grateful for their support. Terrific news about your grant. I know you have and will put those resources to work in service of the truth about U.S. wars for empire. Thank you Global Network!